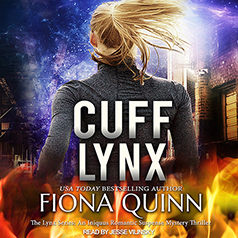 Fiona Quinn presents Book 4 in the Lynx Series: An Iniquus Romantic Suspense Mystery Thriller. In her most thrilling novel yet, author Fiona Quinn exposes the dark forces threatening America. The Hydra, a monstrous group that includes a secret society that will do anything for power, is ready to strike, and only Lexi stands a chance to stop them. Lexi Sobado and her mentor Spyder McGraw work as a covert team to thwart the four-headed monster they've code named The Hydra. No one—not Lexi's teammates, not her fiancé, Striker Rheas, not even Command itself—knows about their mission. They fear a mole lurks among them, but the truth may be even more sinister. In trying to protect the government, the U.S. military might have created the weapon that ultimately destroys America.